"Kupte jednou používejte navždy": EDIUS Pro 9 a EDIUS Workgroup 9 jsou řešení, které si jednou zakoupíte a užíváte bez časového omezení - tak jak to preferuje většina uživatelů. Neexistuje tedy žádný model předplatného nebo pronájmu ani žádné časové omezení. cloud ready: EDIUS může být provozován v CLOUDu. Ideální pro uživatele, kteří mají svůj videomateriál decentralizován. Mync for managing video, audio and stills. Allows tagging, entering and searching for keywords, retrieving and previewing clips in high quality. 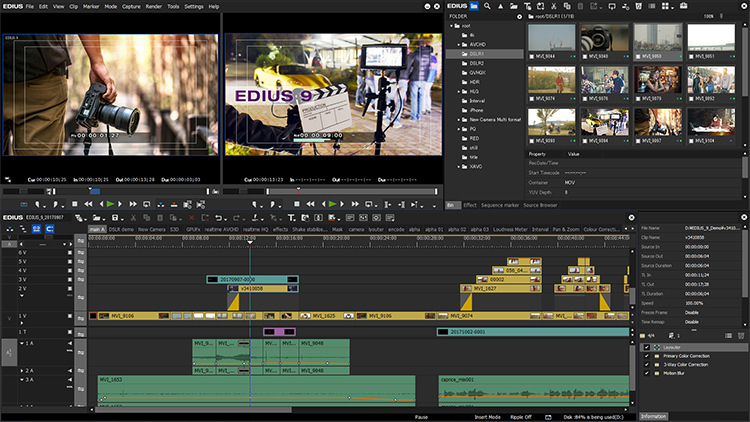 Optimal 4K-workflow supporting 3rd party hard- and software like Blackmagic Design Decklink 4K Extreme, Ultra Studio 4K, Intensity Pro 4K as well as EDL and AAF import/export with the high-end Grass Valley HQX Codec along with DaVinci Resolve 12 as color grading solution. 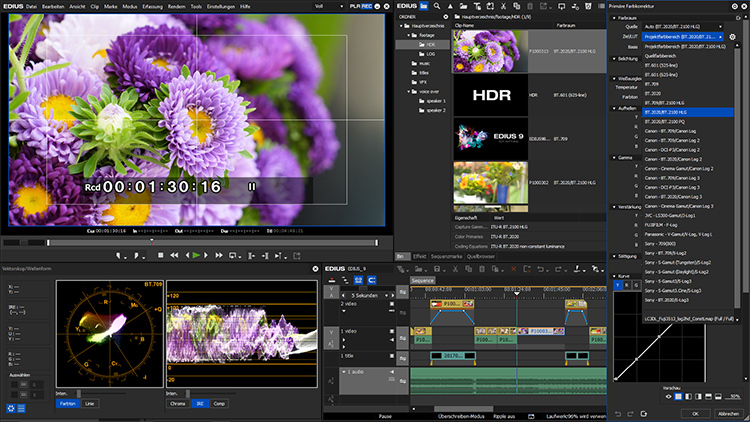 Supports editing hardware from leading manufacturers like Blackmagic Design, Matrox and AJA. Compatible with any resolution between 24x24 pixel up to 4Kx2K, real-time-framerate-conversion on one timeline for a fluent and uninterrupted editing experience. Optimized GUI for an even faster workflow. Optimized visibility and ergonomics supporting 4K/UHD-displays. Fast and easily customizable GUI supporting an unlimited number of video-, audio-, title- and graphic-tracks. Supports the newest file-formats like Sony XAVC (Intra/Long GOP)/ XAVC S and Panasonic AVC-Ultra/AVC-Intra 4K 422. Supports the new Canon 4K XF-AVC-Codecs (import only) that comes with the new Canon 4K-Camcorder XC10 and C300 Mark II. Native support of the majority of different video-formats like Sony XDCAM, Panasonic P2, Ikegami GF, RED as well as Canon XF and EOS and more. Fastest and most responsive editing of AVCHD-material available on the market. 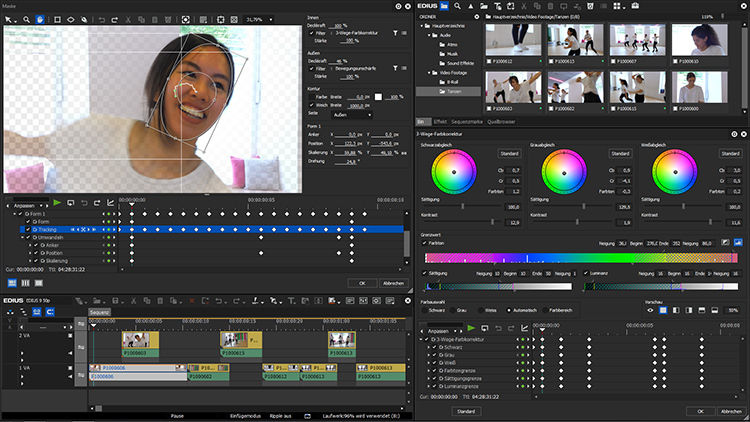 Multicam-editing allowing up to 16 sources simultaneously supporting the editing-card’s real-time video output. Improved H.264/AVC encoder/decoder for even faster encodings of 4K XAVC-material. Optimized playback of 4K H.264-material. Optimized for the Intel Core I architecture 4th generation (Haswell). Native 64-processing allowing the allocation of maximum RAM for an optimal real-time-experience. Proxy mode workflow enabling older computers to work fluently even on complex projects thus securing your investment on hardware (ROI). Supports Intel Quick Sync acceleration for an extreme fast H.264-export (ideal for H.264 based formats like AVCHD and SONY X-AVS S and exporting to Blu-ray disk). Fast handling of large quantities of still pictures (JPG, TGA, DPX and more). Excellent workflow to edit stereoscopic 3D video-footage. Built-in image stabilization enhancing shaky footage. Direct timeline-export to DVD and Blu-ray.